You may have noticed a new face at the Raspberry Heights Workshop. “For the past few months, Ron Callahan has given me the opportunity of my life, because I have been able to be part of a fabulous team teaching technology. This is one of my passions that I always wanted to accomplish, being able to teach kids is a reward that cannot be explained, just to see their faces when they see the result of their work it’s amazing. We are so happy to have Jessica on the Raspberry Heights team. Her nurturing manner lets the students become comfortable with the material, making it easier to learn. Thanks for all you do, Jessica! reminder : classes start this Sunday sign up if you haven’t already registered. Meet Kamau, Raspberry Heights Workshop’s first Advanced level student. His assignment was to come up with an idea of how we can could use the Raspberry Pi to learn about our environment. His first idea was build something to see through walls. After a little discussion of some privacy issues, we agreed to build a weather station that would fly in the air to see if the temperature would be warmer or cooler as it went higher in the sky. We spent some time planning his project and decided to use Adafruit’s BMP180 Barometric Pressure/Temperature/Altitude Sensor. The sensor would be perfect for our needs as is works with the Raspberry Pi and is very lightweight. It required a bit of soldering, but, Kamau was up for the task. 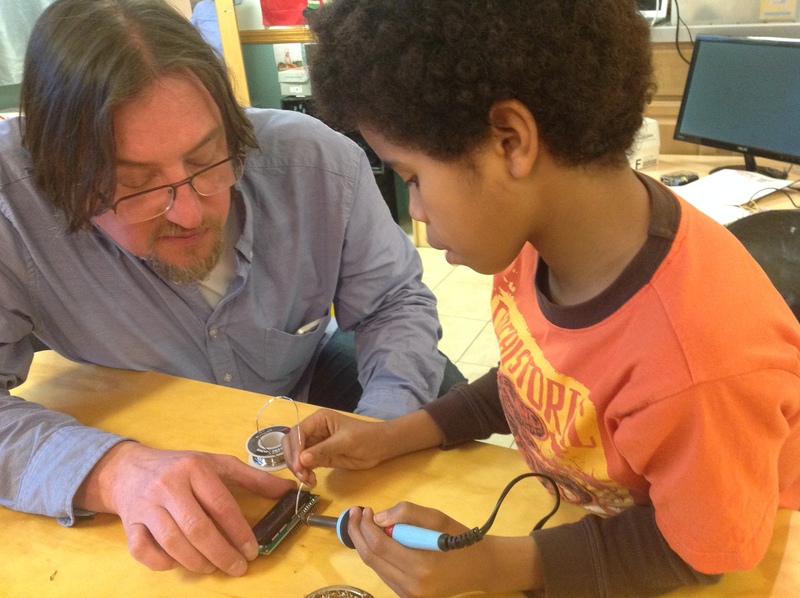 He learned basic soldering in the Raspberry Heights Workshop intermediate level. He draw out some sketches and made lists of materials. Once we gathered up the materials, he began building. We modified Adafruit’s code a bit so it would continually run and give us a running list of the temperature and altitude. Unfortunately, the battery was too heavy and we never got to see it fly. Instead, Kamau simply moved it around to see if the temperature would change. He put it in the freezer, outside in the sun and in the shade to capture different readings. For further iterations of the project, we would need to find a lighter power source and investigate ways to cut the total weight. In the end, Kamau learned a lot building the weather station but more importantly he had fun while doing it. Don’t Miss Out! Classes Start This Sunday. 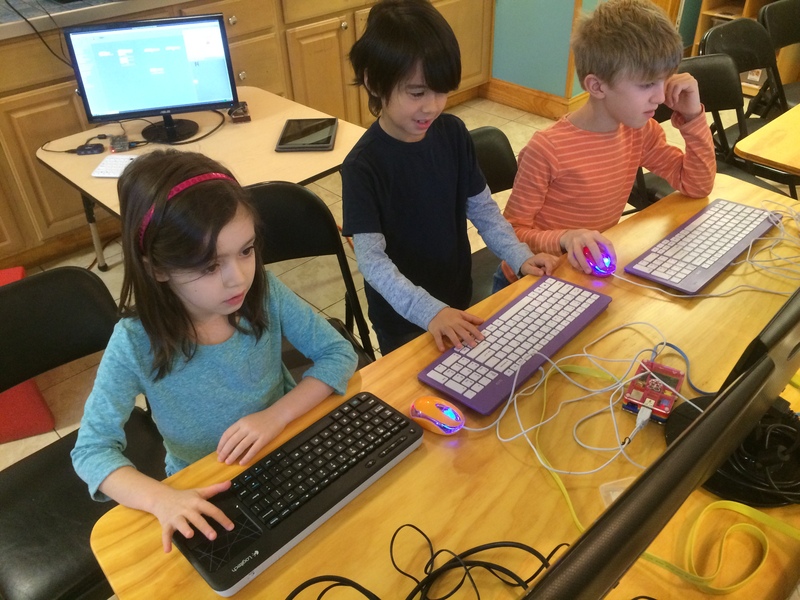 Raspberry Heights Workshop is a four session computer class for kids 6-11. They learn to build, configure and program Raspberry Pi computers while having fun in Jackson Heights. Very happy to be offering our early Spring session. Now open for registration online. Sign Up today. Classes begin March 22rd. If you would like to know more visit our website. One of Jackson Heights best kept secrets according to Queens Mamas! Classes are held at The Jackson Heights Early Learning Center Annex a block away from the Sunday Green Market. There is still time to sign up. Just a few spots open. Join us this Sunday for NYC’s number one computer class for kids. Find out why we won Make: Magazine’s editors choice at the New York Maker Faire. Classes are held in Jackson Heights on Sunday mornings. Go to our registration page to find out more.